Give your older pup everything he needs to keep him feeling his best with Chicken Soup for the Soul Large Breed Adult Dry Dog Food. This diet contains real chicken and turkey as the first two ingredients to maintain lean muscles, and glucosamine and chondroitin for optimal joint health. It has omega 3 and 6 fatty acids promote healthy skin and coat. This food also aids healthy digestion with prebiotic fiber from dried chicory root. With no by-product meals, wheat, corn or soy, Chicken Soup for the Soul Large Breed Adult Dry Dog Food promotes lifelong health for years of barking and belly rubs. Large breed diet with real chicken and turkey as the first two ingredients. Includes glucosamine and chondroitin for optimal joint health. Contains no wheat, corn or soy for a food you can trust. Formulated without artificial colors, preservatives or flavors. New Formulation: Chicken, Turkey, Chicken Meal (Source Of Glucosamine Hydrochloride And Chondroitin Sulfate), Turkey Meal, Cracked Pearled Barley, Whole Grain Brown Rice, Peas, Oatmeal, White Rice, Faba Beans, Millet, Pea Starch, Ground Flaxseed, Chicken Fat (Preserved With Mixed Tocopherols), Natural Flavor, Tomato Pomace, Duck, Salmon, Salt, Calcium Carbonate, Potassium Chloride, Choline Chloride, Glucosamine Hydrochloride, Dried Chicory Root, Dried Kelp, Carrots, Apples, Tomatoes, Blueberries, Spinach, Cranberries, Rosemary Extract, Parsley Flakes, Mixed Tocopherols (Preservative), Citric Acid (Preservative), Zinc Proteinate, Vitamin E Supplement, Zinc Oxide, Yucca Schidigera Extract, Ferrous Sulfate, Manganous Oxide, Manganese Proteinate, Copper Sulfate, Vitamin A Supplement, D-Calcium Pantothenate, Niacin Supplement, Sodium Selenite, Riboflavin Supplement, Copper Proteinate, Dried Lactobacillus Acidophilus Fermentation Product, Dried Lactobacillus Casei Fermentation Product, Dried Lactobacillus Plantarum Fermentation Product, Dried Enterococcus Faecium Fermentation Product, Thiamine Mononitrate, Calcium Iodate, Pyridoxine Hydrochloride, Vitamin D3 Supplement, Cobalt Carbonate, Folic Acid, Biotin, Vitamin B12 Supplement. New Formulation: 3,523 kcal/kg, 374 kcal/cup. When changing to Chicken Soup for the Soul, we recommend making a gradual transition over 7 - 10 days to avoid digestive upset. Add a small amount of new food to your pet’s previous diet, gradually increasing the new and decreasing the previous diet until the transition is complete. Mealtime provides us with special moments to connect with our pets. 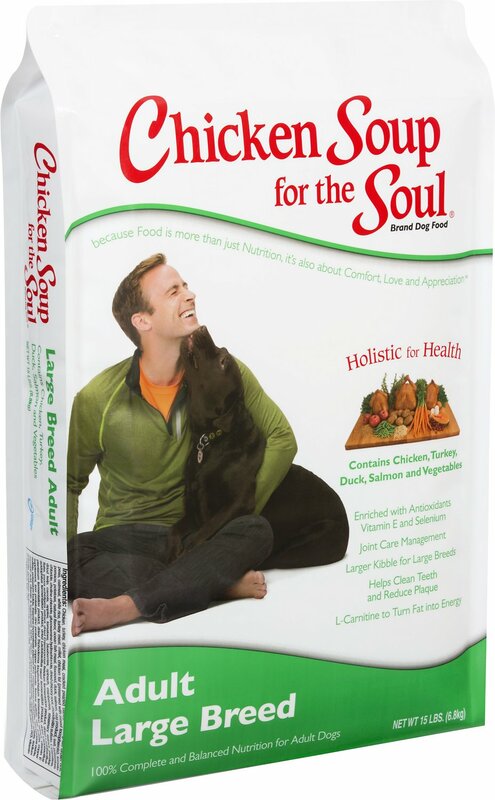 Chicken Soup for the Soul lets you do just that with slow-cooked, flavorful foods that show your dog how much you care. And knowing that your pet is getting all of the vitamins and minerals he needs will give you that same sense of comfort. With the variety of different life stage formulas, appealing selection of real-meat proteins, and options for dietary restrictions, Chicken Soup for the Soul has your pet's well-being as their top priority. The ingredients in Chicken Soup for the Soul are slow cooked for wholesomeness. Low-temperature cooking for a longer period of time helps lock in nutrients and preserve natural flavors. The real meats, fruits and legumes retain all of their amino acids, vitamins and minerals to enhance your dog's overall health. Whether you're looking for grain-free options or making the decision between wet and dry dog food, you will find that superior ingredients are included in all of Chicken Soup for the Soul's pet food. With no added corn, wheat or soy or artificial coloring, flavoring or preservatives, and formulas available for sensitive digestion, Chicken Soup for the Soul has a food to fit any pet's diet. The real chicken, turkey, duck or salmon and wholesome veggies, fruits and herbs support overall health and vigor. Serving your dog the highest quality meats will satisfy his cravings and keep him healthy and happy. Chicken Soup for the Soul uses multiple protein sources for a more balanced protein intake and development of optimum muscle tone. Quality proteins like real beef, chicken, duck, salmon and turkey provide the ideal range of amino acids for overall good health. Offers omega-3 and 6 fatty acids to maintain healthy skin and shiny coat while providing energy. A good source of antioxidants to support and maintain your pet's urinary tract and immune system. Support overall well-being with antioxidants and vitamins A and C, and also offer a good source of fiber. Provide fiber, vitamins, antioxidants like beta-carotene, and minerals, and help promote healthy eyes. Chicken Soup for the Soul combines the warmth and comfort of food with the highest quality ingredients, served with love. 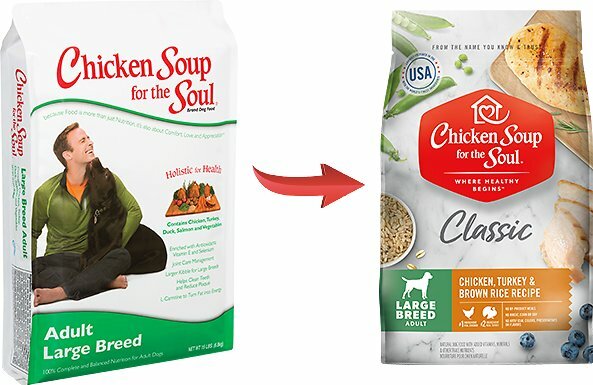 With a dedication to all animals, regardless of where they come from, Chicken Soup for the Soul is proud to support animal shelters and rescues by featuring adopted pets on all of their food bags. By pet lovers, for pet lovers and family owned and operated for more than 10 years, Chicken Soup for the Soul makes all-natural, premium diets for your furry four-legged family members and their own pets too. This must be a good brand cause my Duke even eats it dry...unlike Alpo or others I have tried. I like that is has better ingrediants n no meat by products....Duke gives it 2 large paws up!! I switch my dog's food periodically and tried this one for the first time. My dog loves it and I love the ingredients. Very reasonably priced too. 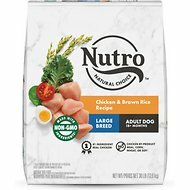 I recently spent 2 full days reading dog food reviews and pros/cons. I did NOT want a grain-free. I wanted a really good food WITH grains AND that fit our budget. Finally, finally made the choice. Our 3 girls have made the change without problems and doing great on this new food. "Our 3 girls" are 2 labby sisters, 6 years old, and a Border Collie, 7 years old. Love the auto-ship and the price fit our budget nicely. Was recommended to try this because my 2 yr old rottie has allergies. I have slowly added this to his current food as recommended by my vet, however, he refuses to eat it. He will eat his old food and leave this. He’s generally not a picky eater. Trying to return to Chewy because I bought two 30# bags however, the box was damaged from heavy rains upon delivery and I threw it out. Their so large I can’t seem to find anything large enough and I’m in a very rural area, no stores around me. Do I have any other options for this return Chewy? I have a Great Dane with a very sensitive stomach and have tried every food on the market. I had never heard of this brand but it is loaded with good ingredients and they offer large breed. My dog loves it, he charges to his bowl twice a day to gobble up every nugget. 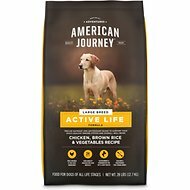 I have been feeding grain free to help his issues (loose stools, vomiting, skin issues and constant burping) but this food is not grain free and it is the best food I have tried. My boy does not have any of the issues he has been suffering with the other foods. I hope they won't change a thing. This brand was recommended by our breeder! We started out with the puppy dry food and have reached the age for large breed dry! Beau, the vet and us feel Chicken Soup brand is great! I got this while it was on a "deal." It has done wonders! My Great Dane, pitbull, rottweiler mix has never looked better, and he's 7. His coat is shinier, his energy levels are up, his appetite has increased, and he's put on a healthy amount of weight and really filled out. Absolutely no regrets with this purchase. My sister and I share a rottweiler pup and had to change her food several times because of loose stools. I was searching for a healthy dog food without animal by-product and came across Chicken Soup for the Soul (had NO idea Chicken Soup had pet food). She began eating Chicken Soup for the Soul puppy at 6 months, she is now 10 months (I'm now mixing the puppy and adult food to transition her slowly for when she's ready for the adult only) and LOVES it. We consistently receive compliments on how shiny her coat is and she no longer has flatulence. I highly recommend Chicken Soup for the Soul dog food. This grain free food is very heart healthy and Sammy loves it!